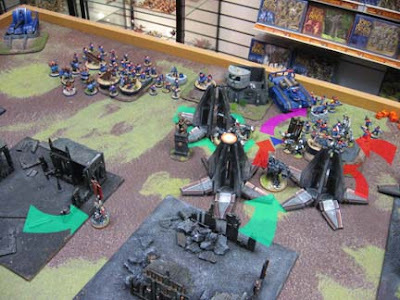 I stopped by my local game sore (Game Vault) the other weekend to see the guys finishing off a recent campaign. With no army, it's hard to get into those kinds of things, but the guys were kind enough to humor me and loan me some Space Marines for the time being. I didn't participate in the final game, but did stop by for a second and snapped this pic at the bottom of the first turn. As I was standing there, I got to thinking about the size (points wise) of games I enjoy playing the most. I don't know exactly why, but 1500 points is the level I enjoy the most. I'm not a big fan of 1750 and higher or even going down to 1250. Maybe because it's just enough points to get a few important units, but not so much that you start tossing things in there to fill up space. You need to be careful what you spend your points on at 1500. There is very little room for "excess." Once you go above it, the games seem to last longer (naturally) and it almost feels like they can drag out sometimes. When I play smaller point games, it seems like some armies have certain advantages that really come into effect at the lower point levels. 1500 points is a challenge for me in terms of list building and playing. I can take my time and bring some strategy to the game. Having only six units in my army helps, but that's not the point. The games tend to move fairly quick and don't take forever to play either. While 1500 points doesn't capture the "feel" of the 40k universe for me, they allow me to play and exercise my brain with little toy soldiers. Follow me here, I like 1500 point games most of all. But... if I want to get the "feel" of the 40k universe, it's Apocalypse all the way. Here's the caveat though: You have to choose the type of people you play with carefully. Apocalypse games are an absolute blast. Models go down on the table by the handful and come up just as quick. For me, this type of gaming isn't about the mental exercise I get at 1500 points, this is all about two epic forces clashing in a spectacular fashion and telling the story. It has nothing to do with the rules. It has nothing to do with exact measurements, saving throws or any of those other rules we all get wrapped up in with our smaller point games. I'm just there to watch a huge battle unfold before my eyes. I'd go so far as to say if you show up to an Apocalypse game looking to make sure you win, you've already missed the point of the game. If you have to look a rule up, then I'm of the thought you should just decide what would be the coolest thing to happen in terms of the story and then go with that. Who cares what the exact rule says? Are we going to spend our day referencing exact wording on obscure rules or are we going to level this city here? Keeping the game moving and having someone else who is like minded when playing this kind of game is an absolute necessity I think. So I'm curious... who else has a double side like this? I know 1500 points is not the standard around here where I play and Apocalypse is not seen all that often, but I still love them both. It's all the other point levels I can do without. And if you're interested in a good laugh, check out The Rending Pony. That Rending Pony is awesome! I'm gonna have to try that out! Taubeast: He's not for serious games... or at least it won't be anymore once you bring him out. I LOVE Apoc games, but we rarely have the time to meet up and play a full weekend of it! I totally agree though; that extra inch of range needed is always freely granted in Apoc, and what looks like difficult terrain at first, can be a road for today!! Carnage is all that matters! As for points, well, im a 1750 man mayself! This is because i feel that i just can't get ENOUGH in my list at 1500! Im entering a 1500pt tourney in 2 weeks, and i've really had to scale back my Vostroyan list to make it fit! It feels so 'bare bones'! And im totally getting a Rending Poney for the next Apoc game.....! I'm of the opinion that the notion that "you really have to think at 'X' point-level" depends largely on where your comfort zone and your gaming group's "meta" is. I usually play 2000pts. When I play 1500, I really have to think. I've met gamers who've jumped from Black Reach to 2500pts and say the same thing at 2000pts. I think everything really comes into its own at 2000pts. It gives horde armies that extra little bit of room for synergy to set off a list, and lets other, smaller more elite armies double up to face down the horde. Apoc runs best with 6 or fewer players (3 per side). Any more than that and it becomes a nightmare. 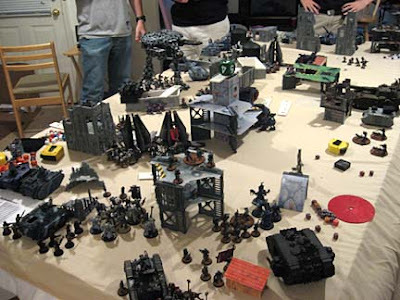 I've been to Apocalypse games where there were 20+ players per side; the disorganization and everyone vying for everyone else's attention was a wargaming hell-on-earth. 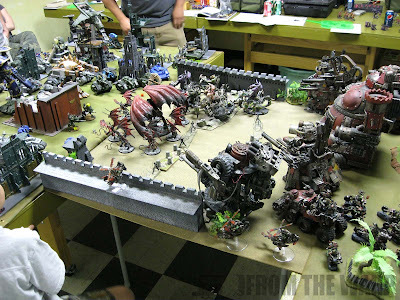 With CSM I did not like 1500 points because once I had a prince or two and a couple troops choices I was already at the point where I had to pinch pennies (points) to squeeze enough other stuff in there to make my army functional. For an older codex full of overpriced units, 1500 feels cramped but would probably be much more comfortable with a codex that has properly priced units. I also love 1500 p games!!! But I'm not a fan of Apoc - games, they are to lengthy. 1500 points is the hardest I think. You have to make difficult choices in your army list that you don't at 1750+. I'm a big fan of 1500, but I've found that it seems to be going out of fashion a little it the UK as people tend more towards 1750, 1850 or 2000. I recently played my first 'proper' apocalypse game and I can't begin to describe how very cinematic it was, but no: it's 1500 for me every time. part of the issue with me is that I'm a slow player and I tend to play an inf-heavy IG list: takes bloody ages! The GunGrave: That's interesting you say you feel like you're running bare bones at 1500 since you're used to 1750. I'm the exact opposite. Myles: There's an idea... your local scene and personal skill levels. As for everything coming into it's own at 2000, I don't know about that. That seems so high for me and once I get to that level, I feel like I'm adding units just to add them to the table. Chaosheade: See, I think 1500 points makes you have to carefully choose what you're going to put down on the table. It's not enough that you can add units without any thought as to what they are going to cost as some might do at 2000 points. Anon: Apoc is indeed long, one of the reasons I think it is best done with a more carefree approach to the whole day. Simo: I agree completely. That's part of the challenge for me at that point level. Admiral: It seems to be going or already gone out of fashion over here. Cinematic is the proper word for Apoc. Everything should be geared towards making it so. Glad you stopped by to see the wrap up. Lot's of lessons learned (by me at least) but your point of just playing the game for what it is, mass destruction, is dead on. Thankfully, the group we play with all seem to have the same mentality of having fun first, rules second (or third or whatever). I agree with Myles that more than 6 of us would have made it more chaotic. Setting the time limit also helped. I think I enjoy the 1750 point level the most; flexible enough to get a good mix while still having to put some thought into the strategy and tactics of the game.